Theresa, I’m usually blown away by your choice of images. 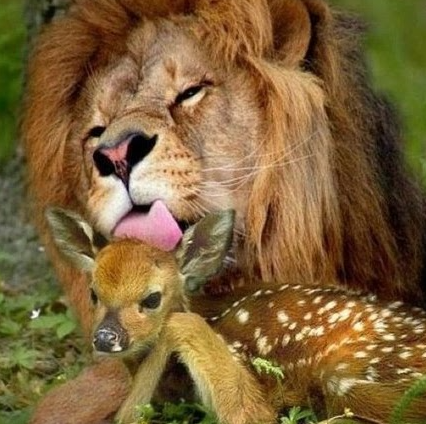 But this time, given the current situation in our world today, I was disturbed by the photo of the jungle’s great predator licking the head of its prey, lulling the young deer into a sense of complacency. I am sorry this image disturbed you, Rosaliene, but can appreciate your perspective. I meant it only from a kindness standpoint, especially between two animals who would normally not live in peace. As always, thank you for your comments. Love the picture and that is a very wise quote. That is the sweetest advice. You never know when your kindness can change someone’s day. You have a lovely blog. Have a wonderful week.